Here are the basics of credit scores: they range from 250-900 and are used by 90% of top lenders to determine your credit risk. Lenders use them to determine how much money they will lend you and at what rates, so you have to be aware of it if you ever plan to rent a home, buy a car, or get a credit card. To put it short, credit scores can have a huge impact on your financial future. Most people have credit scores between 600-750–the average credit score in 2017 was 675. A credit score below 650 is considered poor, and a credit score below 600 is considered bad. If you have a low credit score, you might have a hard time finding a loan. And if you do get a loan, interest rates will be more expensive and you’ll have a harder time finding someone to lend to you. Luckily, poor credit isn’t permanent. Below, we’ve got strategies to “fix” your credit score and maintain consistent, good credit history. 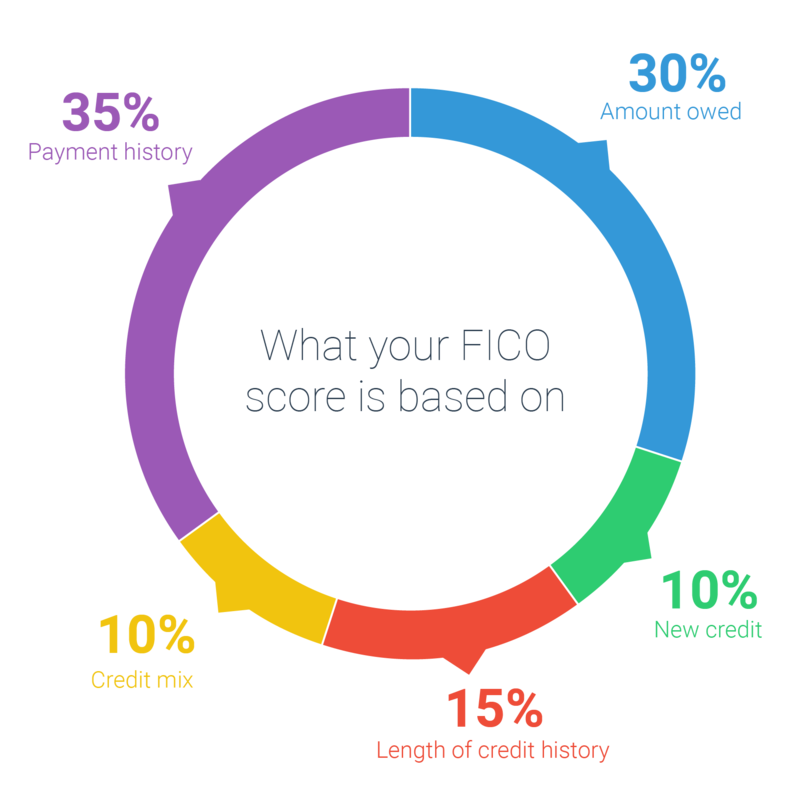 The image below shows what factors FICO considers when calculating your score. When all of these aspects are good, you’ll have a high credit score. It’s important to note that income is not a factor of your credit score, although some lenders may consider it when deciding interest rates. Payment history: This is responsible for 35% of your FICO score calculation and is the biggest contributor to your FICO score. It can also be one of the clearest indicators of why a credit score is low. Payment history looks at things like late payments and if your balance has ever been sent to collections. Amounts owed: High outstanding debts have a significant impact on credit scores–it’s responsible for 30% of your score calculation. It’s a quicker process to remedy than payment history, as the main objective is to get your credit card balances low. Credit mix, new credit, and length of history: All of these have to do with what kinds of credit you’ve been using and how long. More types of loans (student, credit card and auto) will improve your credit. New credit will temporarily reduce your score. 1. Keep a low balance and never miss a payment. This may seem like common sense, but it’s so important to a higher score. Credit scores are easier to raise when credit card balances are less than 30% of the credit limit (below ~20% is ideal) and are accompanied with a history of on-time payments. In the case of missed payments in the past, move on past it and make sure to stay current moving forward. The impact of past credit problems will fade with time–recent on-time payments take more precedence when your FICO score is being calculated. 2. Avoid opening or closing credit card accounts. Every time you request to open a new credit line, an inquiry is run through a credit reporting agency and your score is dinged a few points. If you have poor credit, every credit score point matters so it’s smart to avoid new credit lines. You should also hesitate to close credit cards. Even though it seems tempting to just close all your accounts so you can never overspend again, part of your score depends on your length of credit history. If you close older accounts, you’ll look like you have a smaller experience with managing credit. 3. If you open a new account, do so carefully. Too many new accounts will also reduce your average length of credit history. However, sometimes a new credit line can be good for your credit score. One part of your credit score is your utilization rate. This is the percentage of used credit versus available credit. So, if your credit limit is $100 and your statement balance is $20, you have a utilization rate of 20%. Opening a new credit line increases your limit, so if you don’t make any new charges, your utilization rate will decrease. By law, you’re entitled to free credit reports from each of the three credit bureaus (TransUnion, Equifax, and Experian) each year. Requesting a report won’t affect your score as long as it’s ordered directly from the credit reporting agency or through an organization approved to provide credit reports. You can’t determine the accuracy of your score without your credit report. You have the right to dispute any information that is inaccurate, incomplete, or what you believe can’t be verified. Tip: There is an option to request a three-in-one credit report that lists all three credit bureaus’ reports side-by-side. Since some of your creditors and lenders might report to only one of the credit bureaus, the three-in-one credit report will give you a complete view of your credit history and let you repair your credit at all three bureaus. Your credit score will improve if you are able to lower the balances owed on your credit lines. Sometimes, high debt and low credit feels like a rabbit hole–your minimum payments have become so high that reducing debt and keeping up with expenses feels impossible. There’s always a way to work around this, whether that involves picking up a side hustle or just better organizing your money. WizeFi can help–our software will give you a complete debt repayment plan so you’ll know where to start, how much to pay, and when you’ll be debt free. 6. Get a secured credit card. Secured credit cards are typically the only type of credit available to someone with bad credit history. While they do require a security deposit in order to be activated, it is usually placed in a savings account, money market account, or a certificate of deposit. Banks might convert a secured credit card into an unsecured credit card after a year, given consistent on-time payments are made. It’s important to note that secured credit cards aren’t treated any differently than regular credit cards when it comes to FICO scores, as long as the issuer reports to credit bureaus. If you continue to have help nailing down a strategy to improve your credit score, make sure to seek some help. This can range from contacting your creditors to seeing a credit counselor. They can give you one-on-one assistance in managing your credit and helping you with staying on track for on-time payments. 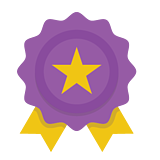 Seeking credit counselors will not negatively impact your credit scores in any way, so it’s always worth a try. It’s never too late to fix bad credit. The sooner you start, the sooner it’s fixed. Since credit depends so heavily on history, the more positive credit experiences you get on your record, the faster your credit is improved. For more information on how to build a good financial foundation, check out this information on how to pay off debt faster and this information on emergency funds. With a little research and some dedication, we know you’ll be able to reach your full wealth potential soon. Danika Schultz is the PR + Content Specialist at WizeFi.